Empanadas anyone? What we are used to is a fried empanada with more crust than filling. These empanadas from La Pippona are light and flaky baked crusts with filling galore. 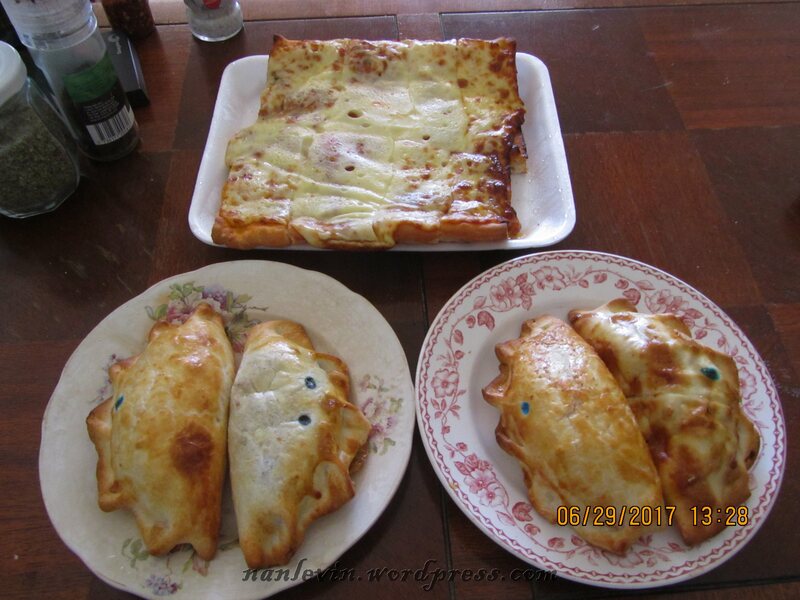 We have tried several of them and so far our favorites are the Mexicana which is super spicy for Uruguay and the Ham and Cheese which is filled with chunks of great ham and a rich creamy melty cheese. I failed to tell you we did order a little pizza as well, this went into the fridge for another meal. Each empanada is marked with dots to represent what the filling inside is and is delivered to your door hot and ready to just dig in. 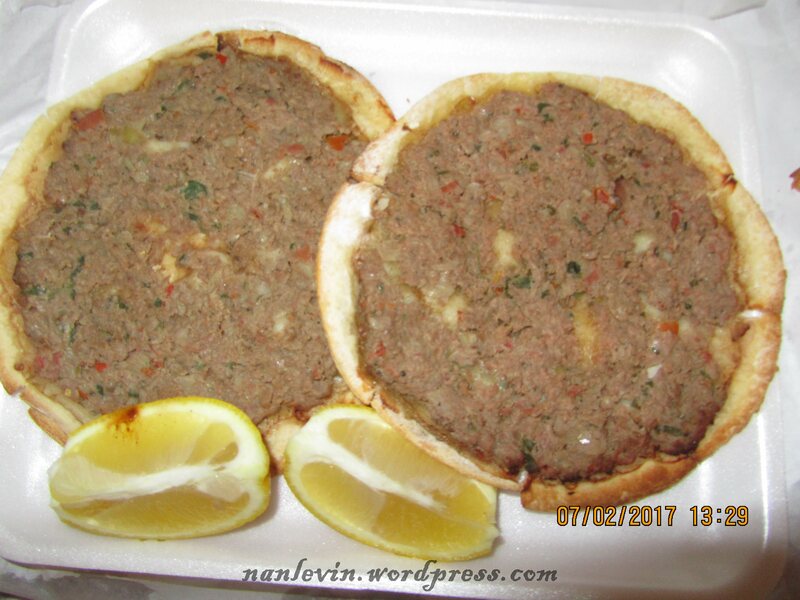 But we have also fallen in love with the Lebanese open-faced Lehmeyun. These thin crusted pizza like flat treats are covered with a meat and spice mixture – this is so different yet so wonderful it sparks your taste buds. Sprinkle a little fresh lemon juice (slices provided with your meal) on top and you are transported to an even better taste experience. And to top off an already great meal they have dessert empanadas. Yes, you heard me correct. We have tried two of the four desserts offered and really loved them. One is an empanada apple pie, hot from the oven excellent. Just the right amount of sugar and cinnamon, thin sliced apples, divine is the only word that can describe this dessert. Actually tastes like the pies Mom used to make. As well as the National Postre (dessert) for all of Uruguay Dulce de Leche we ordered the one with chocolate chips. Honestly not so overly sweet just right for Joe and I to share. 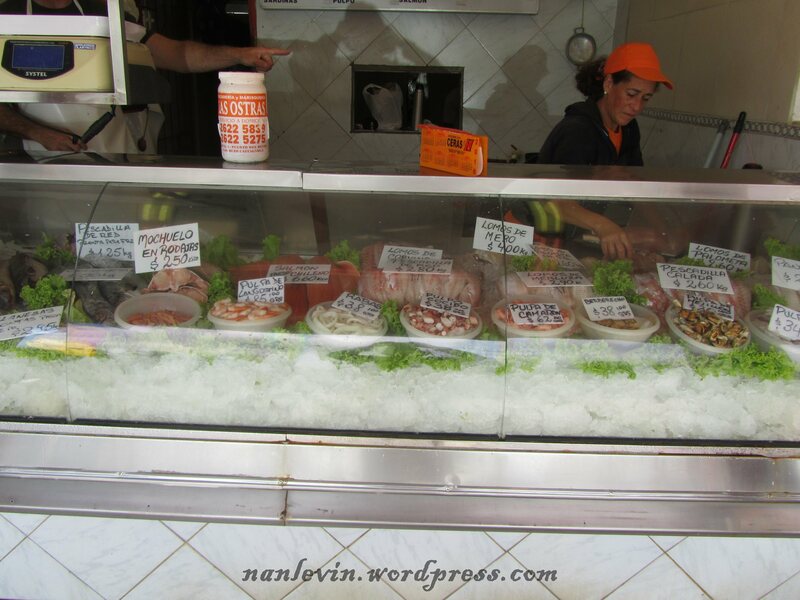 In our research on Uruguay we saw so many comments about the lack of food choices here. We have not found that to be true at all. 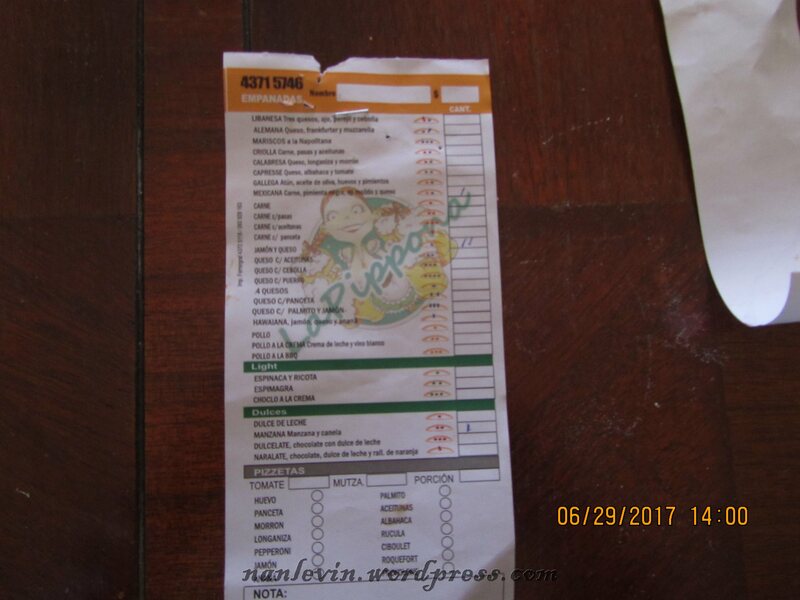 The food varieties are wonderful, you have your pastas even with a special day the 29th of each month where noquis are on the menu at almost every restaurant. You have your choice of flame cooked meats from pork, beef, lamb, chicken as well as sausages galore and if your taste runs to innards they do that as well. Our favorite restaurant so far in Atlantida is Don Vito, the food, the service, the atmosphere are just perfect for our Sunday lunch. They have seafood choices, chivitos, pasta, salads, pizzas and meats as well as a beautiful display case filled with desserts to die for. While in Montevideo we found Tres Fuegos had similar service and food. We have found hamburger restaurants serving just hamburgers, beef or veggie like our favorite Rudy Burgers on 26 de Marzo in Montevideo’s Nuevo Pocitos section. You want Japanese we have found several, even in Atlantida we have Sushi Brothers (will be doing a post on them real soon). Are you into seafood? 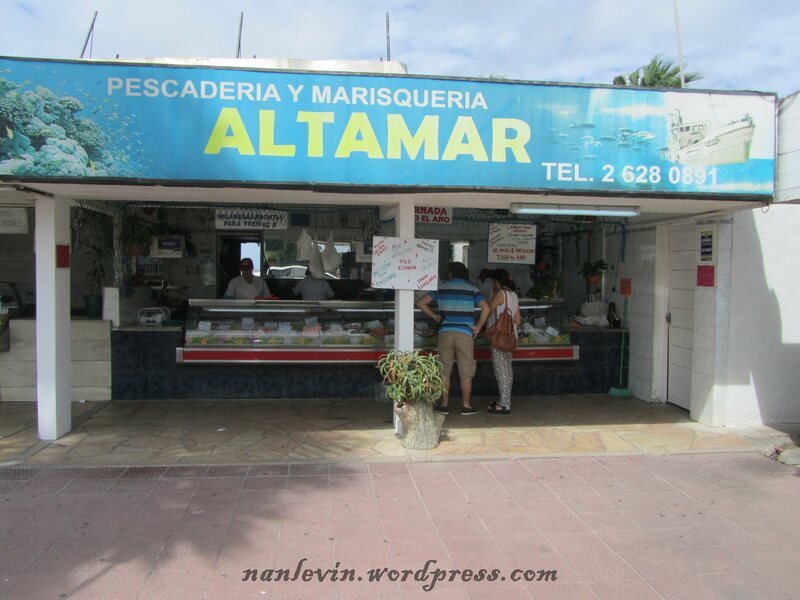 The supermarkets have several varieties of local fresh fish and in Atlantida we even have a fish monger if you really want it fresh. Montevideo has Indian restaurants even take out Indian is available. I just don’t see an issue with the choices. What we have learned since moving from the US in 2006 is you may have to do a little work to have what you want to eat. I have learned how to make so many things from scratch and that only makes me a better cook and we have more wholesome food and eat so much better as I can control what goes into my food when I use fresh ingredients. So you like Thai make it at home you can find most ingredients at your local supermarket. Want Thai Spring rolls, make them. Here the supermarket has spring roll wraps, sushi nori, rice noodles, tahini, soy and oyster sauce, wasabi powder…you want to make Pho they have the spices and other ingredients needed to make your own home-made version. It’s all part of the great adventure. You need to go with it. Something new for us are these little green squashes. Here they stuff these zapallitos with all sorts of things and bake. I bought several and used a few in my ratatouille recipe. Had two beauties left so I decided to make my own version of these little baked babies. Set the zapalittos aside. Place the olive oil to heat in a frying pan, add the oregano, garlic and sauté for one minute add the chopped meat and cook until the meat is no longer raw. Move to a plate. 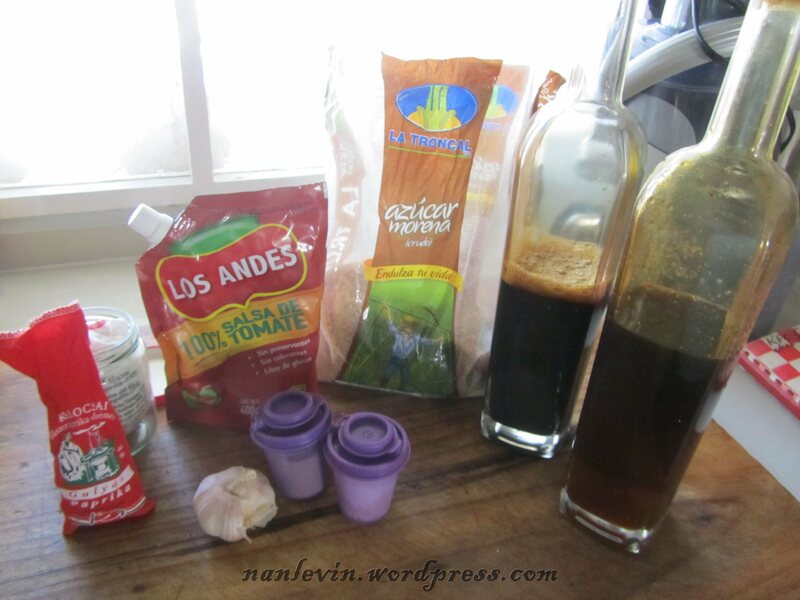 Add all the veggies and sauté for just a few minutes add the meat back and cook for just a few more minutes. Add salt and pepper and check to see if it needs more. 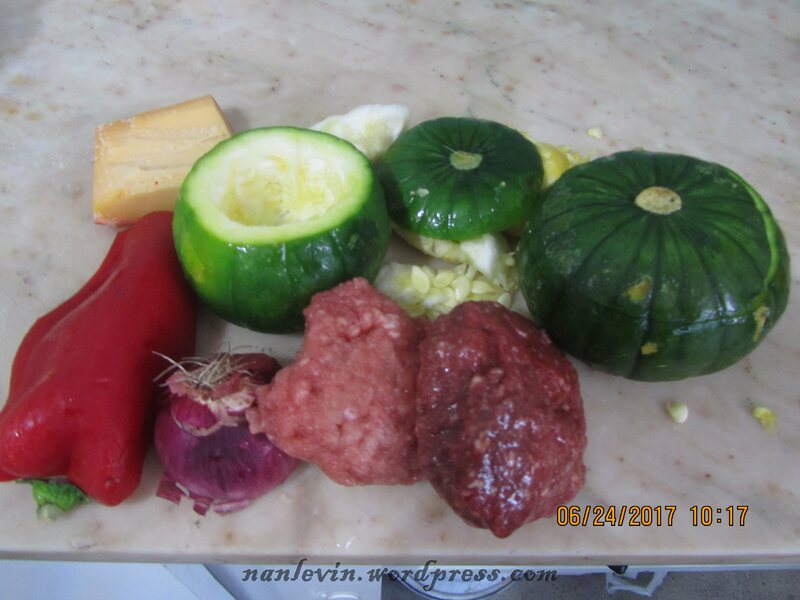 Add a few small cubes of cheese to the bottom on each squash. Add one large tablespoon of the filling, more cheese, continue filling until the mixture reaches the top of the squash. Press down to use all filling. Place the lid on top and put in a 350 oven for 30-45 minutes. The squash shell should keep its shape. 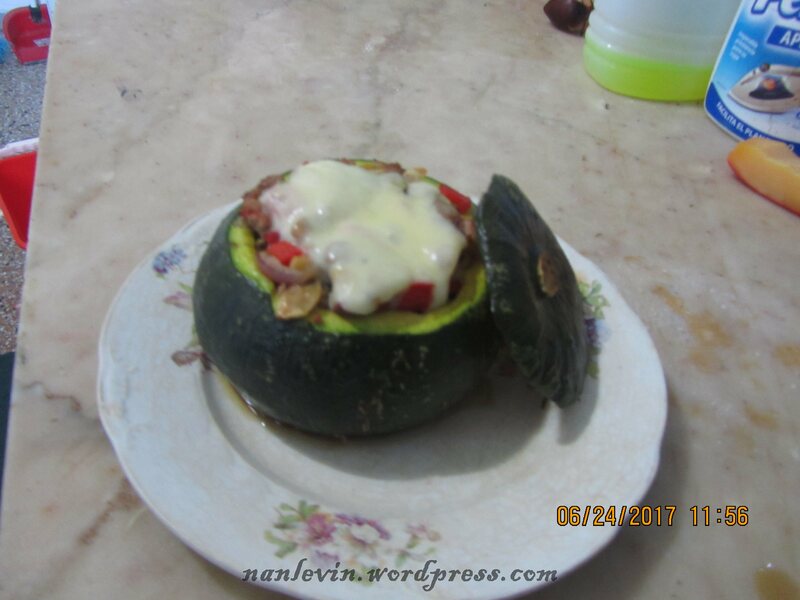 Right before serving remove the squash top and add a slice of mozzarella cheese. Put back in the oven and allow to melt. Serve alone or with rice or mashed potatoes for a great lunch or dinner. Way back when we were just kids I had a good friend, Shiela Adelman. We lived in South Florida at the time and Sheila had a exercise studio where I taught aerobics classes. Besides being a great exercise instructor she was also a great cook. She would use chicken wings for this recipe, I love using skinless chicken legs and other times I would use boneless and skinless chicken thighs. Honestly the recipe will work with any cut of chicken. Mix all the ingredients together until the sugar is melted. 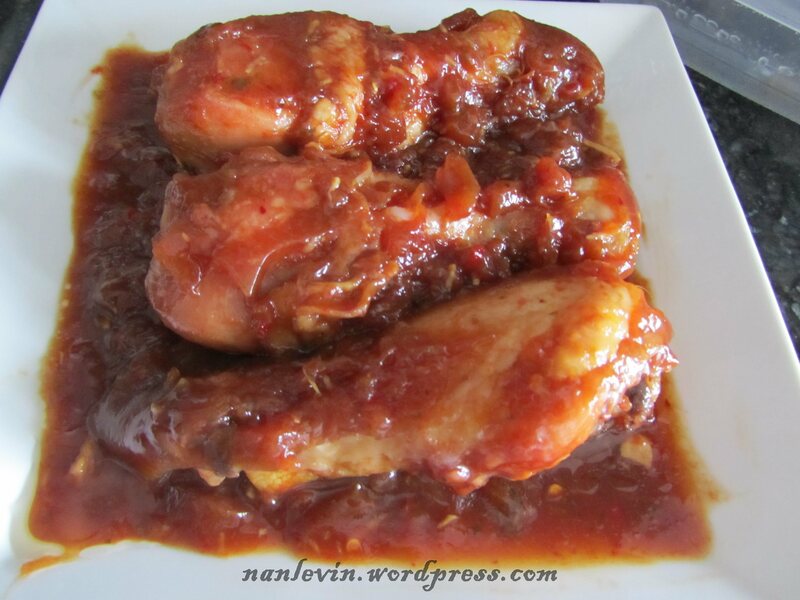 Put your chicken wings, thighs or legs in the mixture and allow to marinate overnight in the refrigerator. Bake at 400 degrees F for 1 hour. The sauce should be thick and the chicken tender. Enjoy! Oh, and be sure to have a few napkins handy! 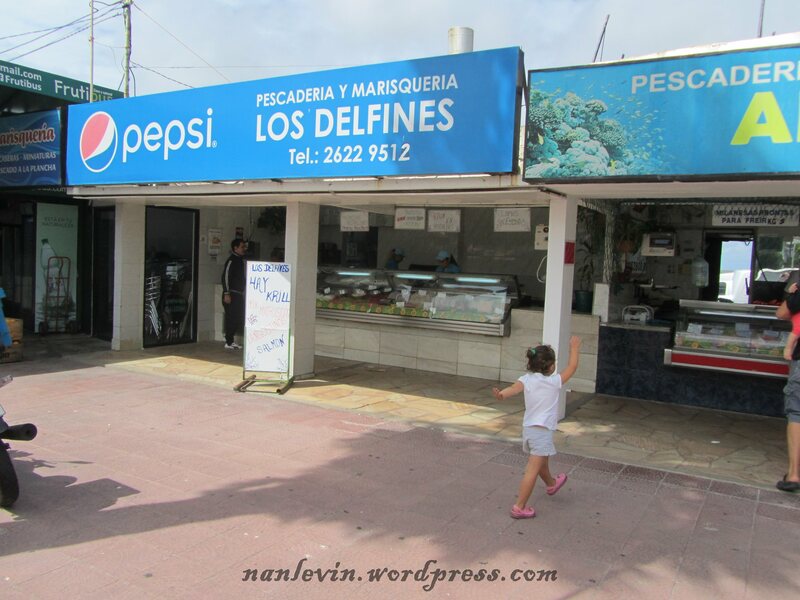 On Saturday we walked down to the Buceo Port as Joe was asking for fish. We got the salmon again, and just like the first time, it was fabulous. 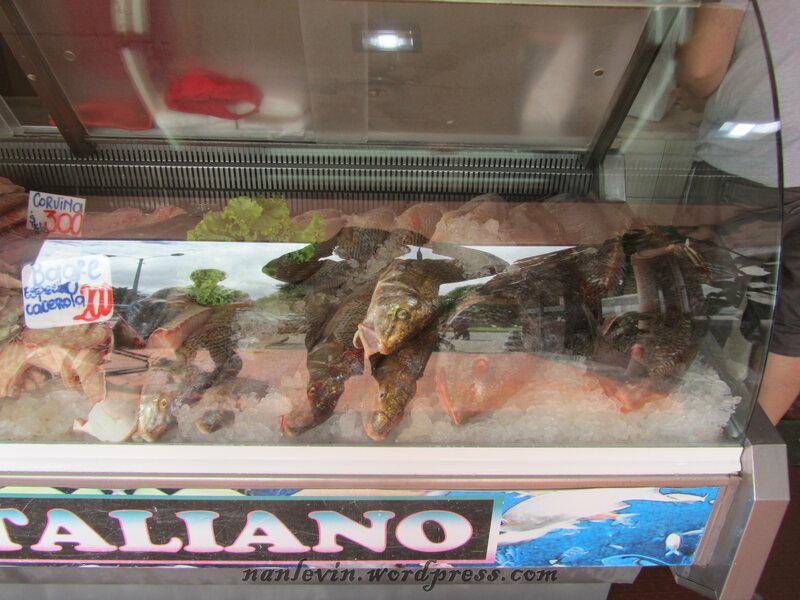 All the fish looked good and even things like calamari, octopus and the mussels looked fresh and very appealing. 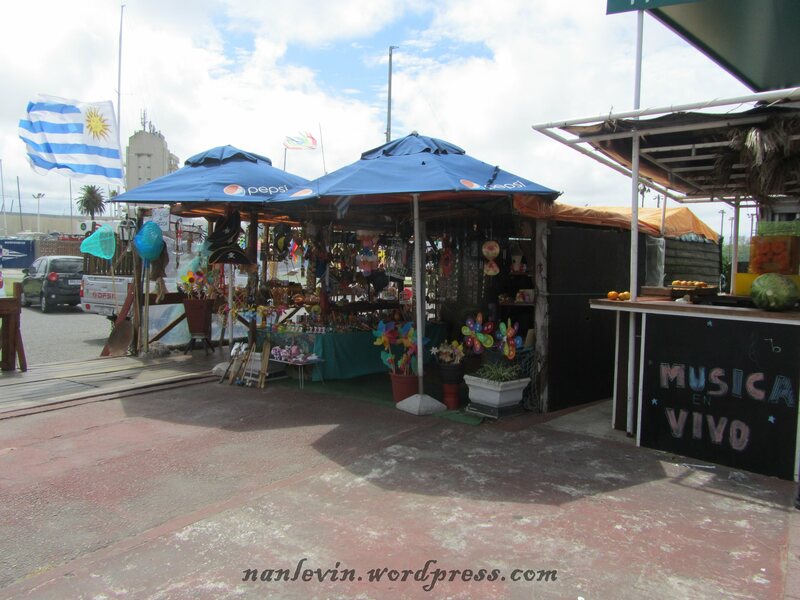 Prices are in Uruguay Peso, convert to US Dollars by dividing the number on the card by .28. All of these prices are for a kilo which is a little over 2 pounds. You can buy a whole fish or you can buy steaks or fillets. 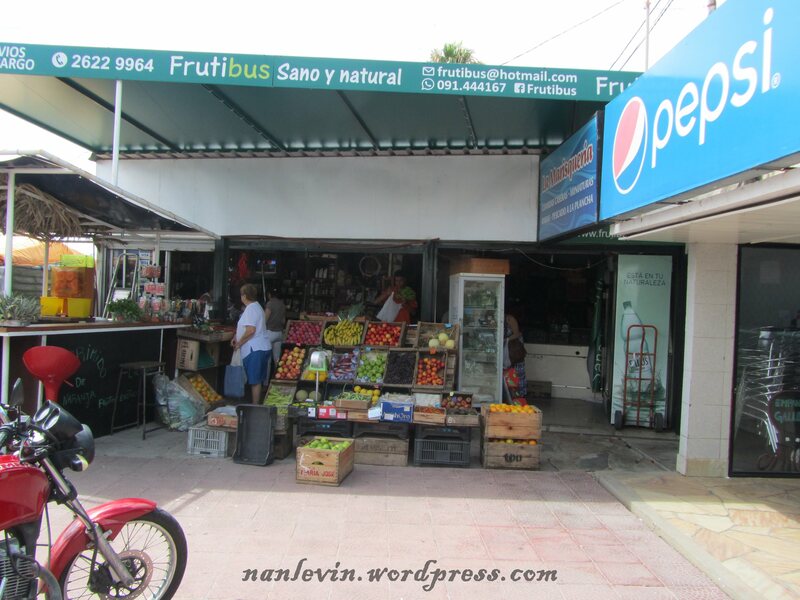 There are two other stores including a store with local trinkets as well as a vegetable and fruit stand that carries spices, herbs, a few live herb plants and has a cooler with drinks. A new addition from the other times we were there was a van backed up to the sidewalk and the back door opened. 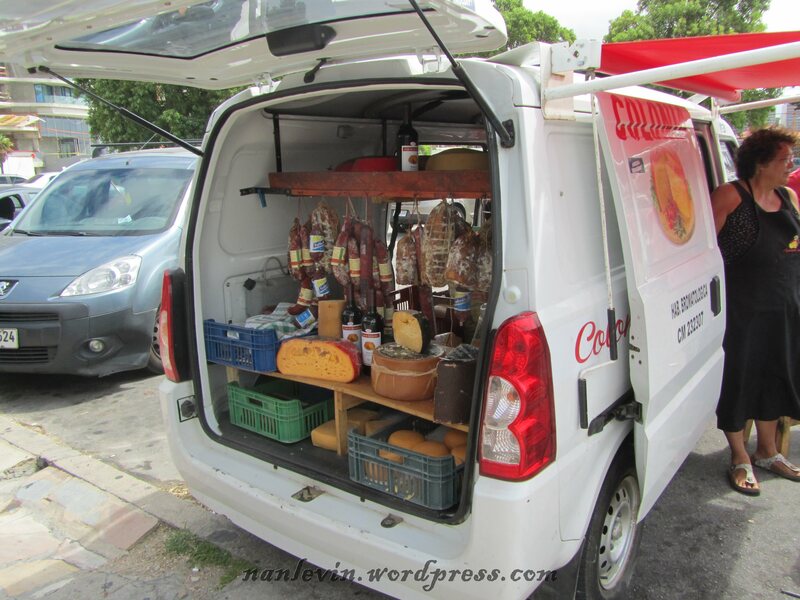 As you can see it had a variety of cheese, wine and salami. We got our salmon and ran home to have lunch. 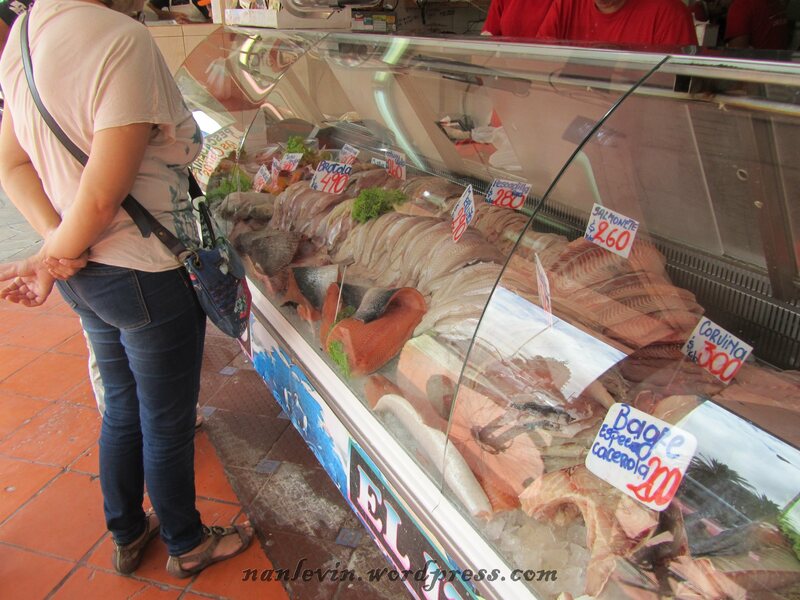 I am not sure how the Uruguayan people would take me calling this lunch meat, but that is what it resembles to me. 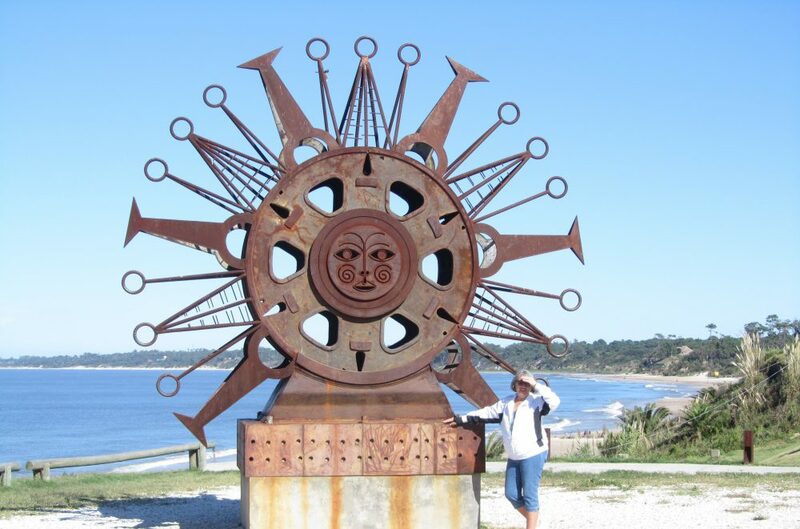 Joe did a great deal of research before we moved here, we saw videos, had slide-shows and generally discussed Uruguayan customs, foods, housing, language, futbal and of course its people. One major discussion item was food. I love to cook, I love to bake and we both love to eat, so many of our after dinner slide-shows included food. Matambre is a rolled stuffed beef dish made here in Uruguay as well as Argentina. We have seen it for sale in the local supermarket and decided to try it. The bread is Pan de Campo or country bread. It was a huge round loaf and this sandwich is only half a slice of bread. 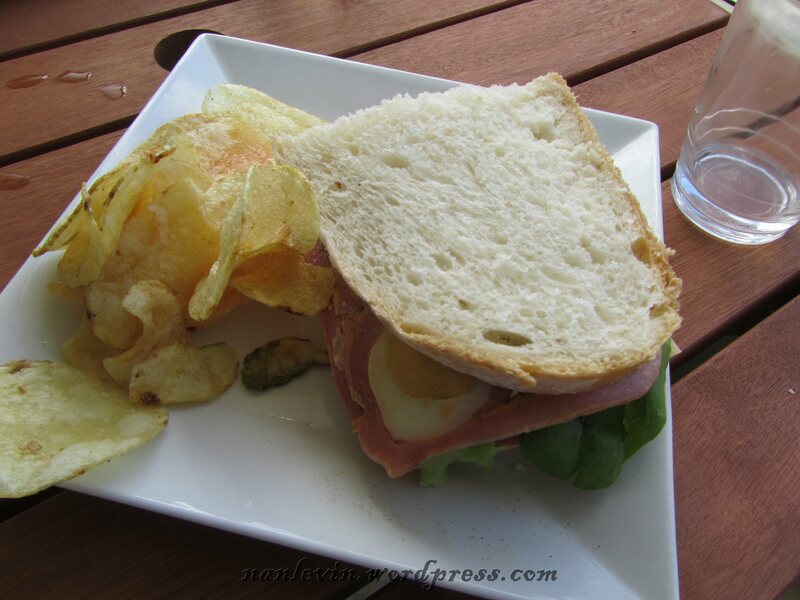 I am not sure what the Uruguayans would use on the sandwich but I added leaf lettuce and mayo. It went over very well. I would buy it again. Yum! 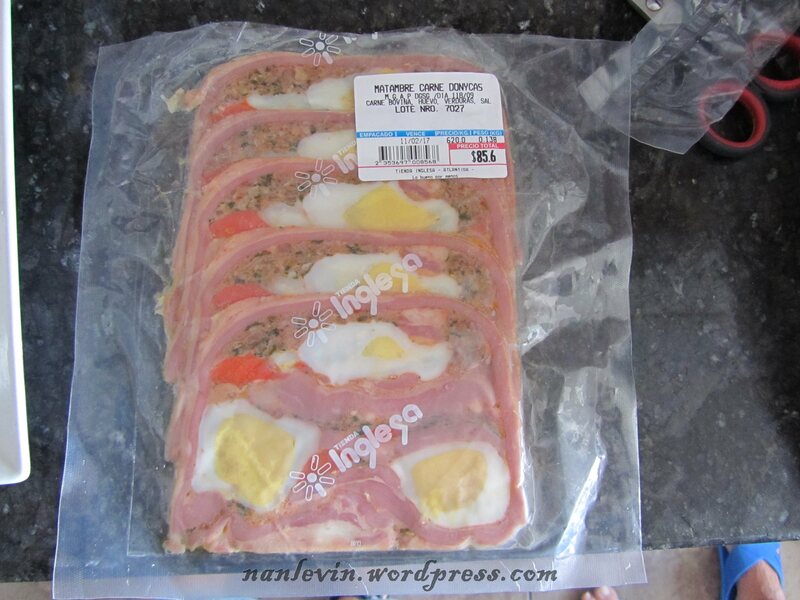 Last night before bed I was thinking what wonderfulness can I make tomorrow morning. I have decided that we can eat “good for you” food every weekday but the weekends are special and we should have something even better. So Sundays I make something wonderful like Lobster Rolls or a Pork Tenderloin Roast with Homemade Sauerkraut and Root Veggies or a Moroccan Roast Chicken with Guava Paste. But Saturday morning should be special also. So I remembered making scones once before. The recipe was from a Rachael Ray cookbook and honestly it did not do it for me. So I got on the computer and found a recipe from All Recipes. Heat the oven to 400 F. In a medium-sized bowl mix the top 5 ingredients. Grate the butter into the flour mixture and with a pastry blender or two knives cut the butter into the flour mixture. Do not use your hands as it will melt the butter. Add the walnuts and mix well, place in the fridge until ready to add the wet ingredients. In a separate bowl add the sour cream or the cream and vinegar mixture and set aside. Add egg to cream and mix well. Add your egg/cream mixture to your dry ingredients. With just a few strokes incorporate it – it will have dry ingredients that have not mixed well. No problem just turn out onto a work area (I use a large plastic place mat). With your hands knead gently until you have a soft dough. Do not overwork, you do not want to melt the butter pieces. Just a few strokes with your hands should incorporate it into a nice dough. Shape into a disk about 1/2 inch thick and approximately 7 inch diameter. Sprinkle top evenly with cranberries and pat into the dough. Sprinkle with the white sugar. Cut like a pie into 8 pieces. Place on a baking sheet with parchment or another non-stick mat. Bake for 15 to 17 minutes. Watch that the bottom does not burn. Serve hot with honey butter mixture or my favorite cream and honey. 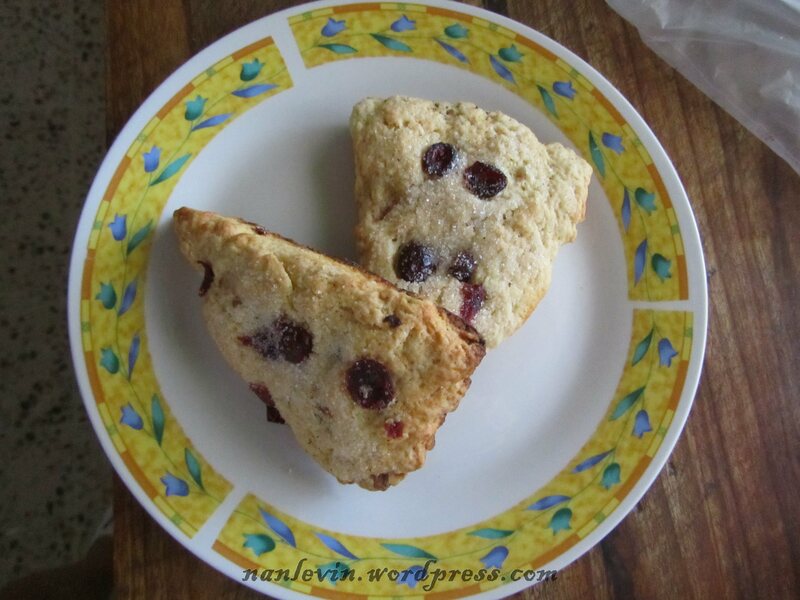 Mix together and serve on the side with the hot scones. Great with a good cup of coffee sitting on your porch watching the street come to life.